With this hard economic time, having a work back-up to setting off bills is a necessity. That’s why renovations have become part of my daily life ever since I started doing it as an extra earning activity. I won’t say it’s easy, but it takes passion, commitment, patience and in no time you will be in a great financial state. My renovations at times vary from common house lift since in the recent past I started purchasing those old houses renovating them and putting them back to the market for sale. It’s not an easy task though, but with the right equipment and professionals, I get to achieve my goals at the end of the day. And my new trust-worthy friend is the Ames poly wheelbarrow which makes my dreams of earning extra dime very alive. The Ames wheelbarrow has a sprout design that makes it very efficient when it comes to pouring liquid-state loads. I love how it’s fast and accurate when it comes to pouring gravels within my renovation sites. The pour sprout design also gives the wheelbarrow a total face life and makes it elegant too. Talk of easy offloading, just purchasing this beauty has becomes very handy in my line of work and at times I am left amazed. Just forget about the elegant and sleek, handy wheelbarrow, this wheelbarrow is a one of a kind. It has a corrosion proof poly tray which makes it unique. At times especially on a stressful day I easily forget to take my wheelbarrow to the garage. And this amazing corrosion proof poly tray makes me worry less since the wheelbarrow is designed to withstand rainy days. The wheelbarrow has an amazing ash handles which are American ash double coated and clear. So that rustic feel of the handles is retained giving it an appealing appearance at a glance. I love how the rich wooden brown color of the handles stands out and the way it blends with the black all thanks to the double clear coat. The handles are non-slippery and make it easy to grip them so working on the wheelbarrow becomes very easy and less tiring. I have never fancied those small carrying capacity wheelbarrows since they tend to slow down the work performance and I find it as a time waster. I love to work on my deadlines, and if I use the wrong size of wheelbarrow, then the possibility of me messing and being unable to beat the deadline becomes more of reality. That’s why I prefer to use a wheelbarrow of the huge carrying capacity which also makes my work a bit easier and fast. Just perfect for my daily work. I don’t believe in having a boring equipment just because am working on a project. Naturally, I am a sleek woman and elegance, or looks do matter a lot in my life. I don’t know if it’s because am a woman or what, but what I know is I love my equipment elegant. And this amazing Ames wheelbarrow splash elegance to my daily work. Double clear coated ash handles. Q: What is the wheelbarrow’s size dimensions? 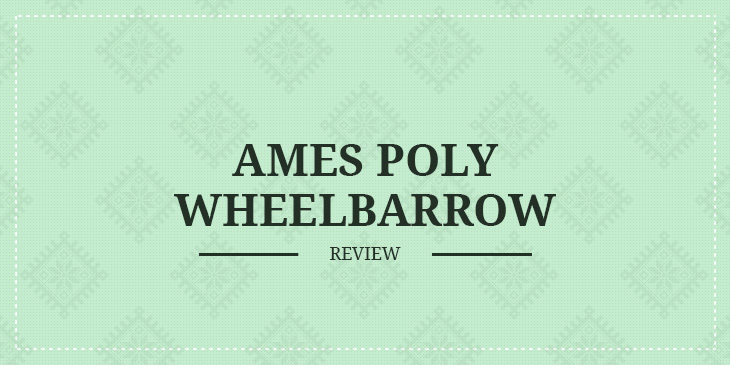 A: The Ames poly wheelbarrow has a size dimensions of 59.8 x 29.5 x 26.5 inches. Q: Can the wheelbarrow be classified as a lightweight or heavy-duty when it comes to its performances? A: It can be used for both light weight and heavy duty work. Q: What is its overall weight? A: The Ames wheelbarrow has a total weight of 29 pounds. Say goodbye to the old spade offloading and embrace the most efficient and accurate way of pouring which is possible with this pour spout design. It has retained the sleek look it once had while it was still new which a bonus is. And trust me, I do use the wheelbarrow in most days, and I find it very easy to use and push around thanks to its amazing handles. So far am not about to complain about its carrying capacity. At times leaving a good impression to people matter since it kind of build trust within them and makes me confident with my work which is why I select my design with a lot of care and attention. I totally recommend this Ames poly wheelbarrow. 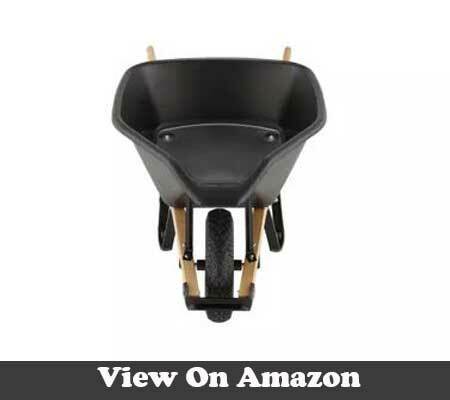 Buy Ames poly wheelbarrow on Amazon, Now!